I’ll be at Calne Library in Wiltshire this Tuesday evening with the irrepressible Ben Kane, author of Roman military fiction and owner of a pair of repro Roman boots that walked Hadrian’s Wall last summer and helped to raise thousands of pounds for charity. You won’t have to donate to come in – just pay £3 for a ticket. Phone 01249 813128 to book. These are the last two events for this year. It’s been an enormous pleasure to meet so many readers, writers, bookshop and library staff on my recent travels, and to reconnect with real people beyond the desk and the computer (which is not to insult the family and friends here, but it does sometimes seem as though the entire business of writing is a fantasy world that I just make up to fill in the hours while other people are out there doing proper jobs). We were in some splendid venues, but my plans to take lots of photos were thwarted by a failure to pack the camera. Here, with apologies, are the best of a bad bunch from the phone. First – on the right, the leg bones of an elephant. I can’t remember which sort of elephant, but a trip to the excellent Eton College Natural History Museum will tell you. It will tell you many other fascinating things too. On the left, me. The photo was taken by Karen Maitland, author of marvellous medieval thrillers and not at all responsible for the fuzziness around the edges. We were there talking about Ancient and Medieval medicine as part of the Thames Valley History Festival, which runs until 17 November. 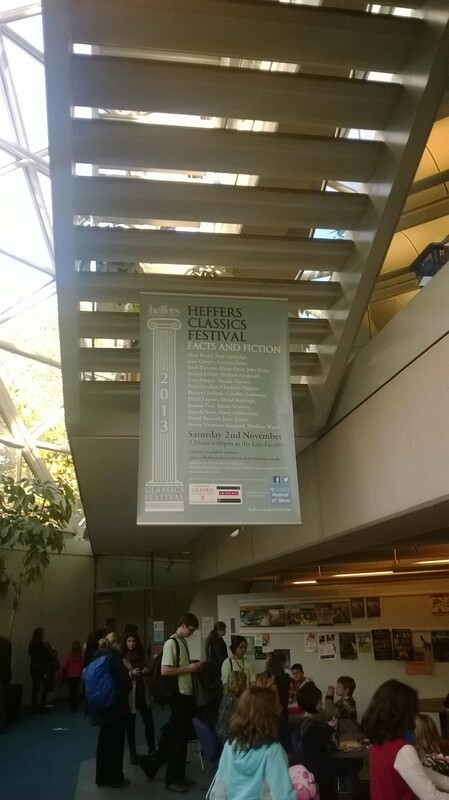 Next up – Heffers Classics Festival, held in the university Law Faculty at Cambridge. To say I was nervous beforehand would be an understatement, but it was a fantastic day with loads of good speakers – if they do it again next year, I’d very much recommend it. 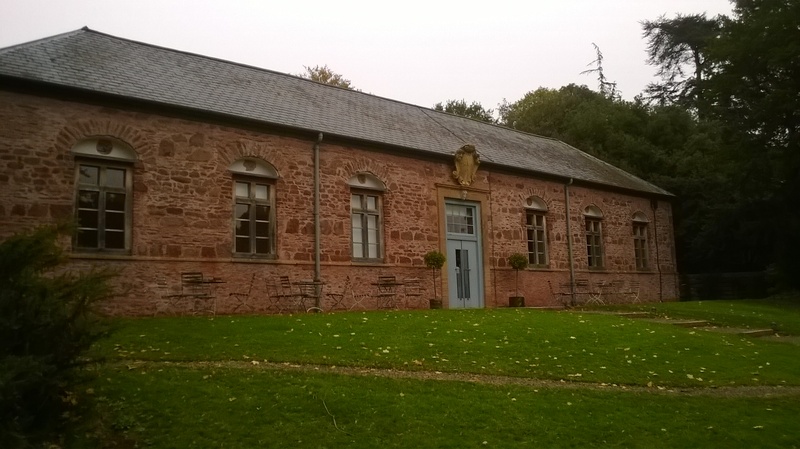 And finally – this is the Bamfylde Hall at Hestercombe Gardens, near Taunton – one of the venues for the Taunton Literary Festival, being run by the enterprising folk at Brendon Books until 19 November. Luckily I was early, as the local lanes have to accommodate cows as well as cars, and cows do not move very fast. After this… I really do plan to get some writing done. Previous PostWhat a weekend!Next PostWriting – a spectator sport ? You’re certainly hitting the road just now – good luck with all of it. It was such fun seeing (and of course hearing) you at the Heffers Classics Festival in Cambridge. Wasn’t it a wonderful mixture of history fact and historical fiction? Thanks Jane – it was great to see you at the Heffers day, and yes, it was a brilliant event with so much happening. Mind you I always come away from something like that feeling sobered by the discovery of vast tracts of ignorance I didn’t know I had before I went! I’d love to attend any and all of these someday! Have fun. Hope you make it across here one day soon, Petrea. There’s certainly no shortage of things to explore. My 6 week visit some years ago left me wanting more. I could spend a year in England and never get enough. I think whatever organization is charged with enticing tourists to visit the UK, should pay you a salary. Years ago Roger Miller, a songwriter and singer here in the USA wrote an affectionate song of your great country called “England Swings”. In the song he says that if you finally save enough to take your family on a trip across the sea, take a tip, go to England. The pictures and stories of your travels easily show the wisdom behind Roger Miller’s musical tip . Your “really do need to get some writing done” sounds like you might be feeling guilty about doing things that are perhaps more fun than siting at a computer. I have a feeling that if you were the boss of others instead of the boss of yourself that you would not cast a cloud of guilt on your employees if they needed time off to relax and recharge. Phil, I have to admit that one of the greatest – and unexpected – pleasures of taking up writing has been the licence it gives to follow one’s nose and explore all sorts of places and topics simply because they’re interesting. It was a long time before I grasped the fascination of the past. Despite my father’s best efforts, none of his children paid much attention when he took us to historical sites – we were mostly interested in whether or not there was an ice-cream van. So now I have the evangelical zeal of the convert! Hi, Ruth! I second the opinion of the Yank who suggested earlier that it’s bittersweet to hear about your readings and talks in the UK. Of course, we’re tremendously envious of your British fans who can meet you in person. But more important, we’re waiting impatiently for you to finish the next Ruso novel! Please have pity! Sherry, I promise you meeting me in person is not as exciting as you might suppose! I wish I could take Ruso and Tilla with me. But I’m delighted to say that the next book is with the editor, so should be out next summer. It’ll be called TABULA RASA, and it’s set during the building of Hadrian’s Wall.